There are very few people who understand the true importance of protecting the tiger. Most people feel it is only a matter of saving an animal that makes a beautiful sight to see. This reason only makes up a fraction of why we need to save this incredible animal. The tiger is at the top of the food chain in the jungles that it roams. The following is a very basic description of the chaos that would ensue if the tiger became extinct. If this was to happen, the populations of prey species like Spotted deer and Sambhar would burst at the seams. This excessive population would then totally ravage it’s food source – vegetation. If the vegetation in the jungles was devastated, where and how would the insects survive. They may even shift to the crops in farmlands. If the plants in the jungles would be finished, what would refurbish the soil. If the soil was no longer fertile, new plants would not sprout. Over the years, this would probably mean the end of the jungles. The end of jungles also means the end of the biggest suppliers of the oxygen filled air, which we take so much for granted. This is a very simple layman description of what the result of tiger extinction could mean to our own survival. The truly scientific description is even more alarming and drastic. It isn’t necessary for every one of us to take world-awakening steps. All we have to really do is influence those that are a part of our own lives. Obviously, anyone wanting to do more than that is another breath of fresh air for a dying tiger. There are many NGOs and other organisations that are totally dedicated to protecting the tiger. We will try and, as soon as possible, give you a list on this site of such organisations, which you can contact and lend a hand in tiger conservation. It is important to realise at the outset, if you are intending to help in this line, that protecting the tiger does not necessarily mean working in operations dealing directly with the tiger. It could easily mean working on assignments dealing completely with villages in Park buffer zones, other animal species, welfare of staff working in reserves, villagers, issues dealing with cattle grazing, etc. 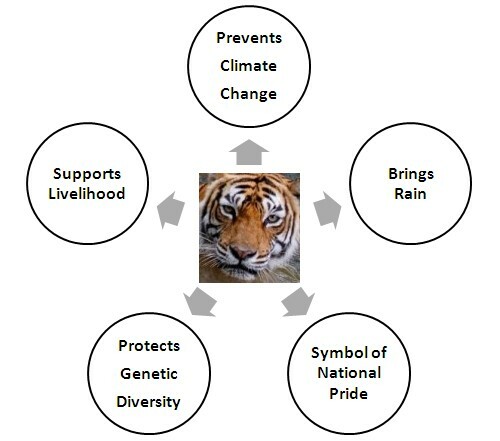 The one thing that is common with all these assignments is that they are all directly or indirectly aimed at protecting the jungle and it’s inhabitants, which obviously includes the tiger. The main thing that requires a mention here is that if you care for the tiger and want to do something about it – the time is NOW. Act – before it’s too late. Tourism is the world’s biggest industry. On the ecotour front, the tiger is a star attraction for not just the Indian tourists but also for the people coming from other countries. There are foriegners who come to India only to have a glimpse of the tiger and then there are others who return more than once for another such opportunity. The look in the eyes of a canter that has just come out of a National Park after sighting a tiger is very different from the look and feel of a canter that could not sight any. This eventually impacts the tourist influx thus impacting everyone from the tour companies to the local tour guides. A healthy tiger population thus supports livelihoods as well. Tiger is an umbrella species. It’s conservation automatically ensures the conversation of a large number of flora and fauna and entire ecosystems. Thus, a properly planned tiger conservation programme is actually a programme to protect and save large number of species. However, a dwindeling tiger population and news of declining number of tigers only implies an immediate threat to what is remaining of our natural ecosystems. A healthy tiger population thus also protects all that remains of our natural ecosystems. A tiger is a both a guardian and an indicator of a healthy forests. A healthy forests. Few understand that a live bird or insect is far more important to the economy than a dead one. A live tiger brings rain – a dead one brings nothing but devastation. A healthy tiger population lives in large forests – which are nothing but the natural sinks of Carbon. The more tigers we can save, the more healthier reserves we have, larger is our national carbon sink. A tiger should therefore be entitled to carbon credits in the form of protection. The magnificent tiger, Panthera tigris is a striped animal. It has a thick yellow coat of fur with dark stripes. The combination of grace, strength, agility and enormous power has earned the tiger its pride of place as the national animal of India. Out of eight races of the species known, the Indian race, the Royal Bengal Tiger, is found throughout the country except in the north-western region and also in the neighbouring countries, Nepal, Bhutan and Bangladesh.